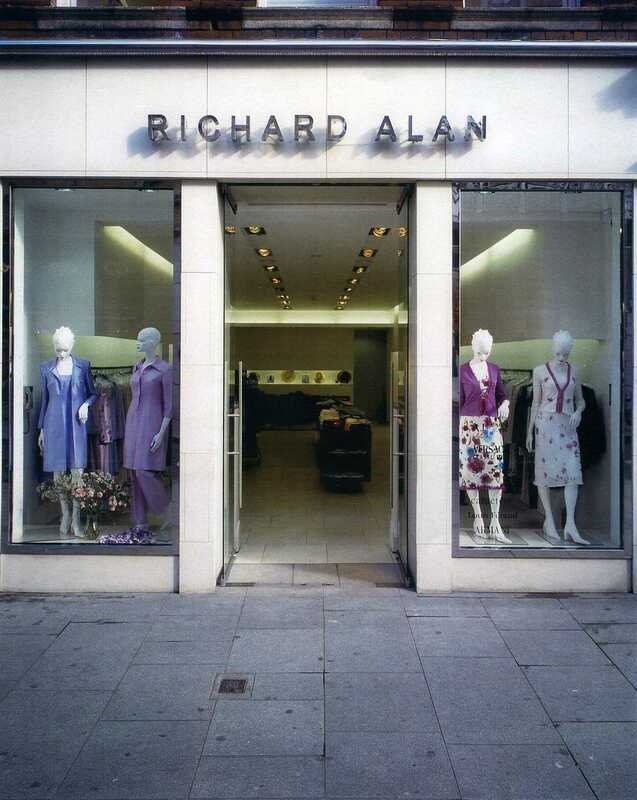 In 2002 the Richard Alan shopfront won a Golden Rose Award for Civic Pride and Shopfront Design. The building is a grade 1 listed building. 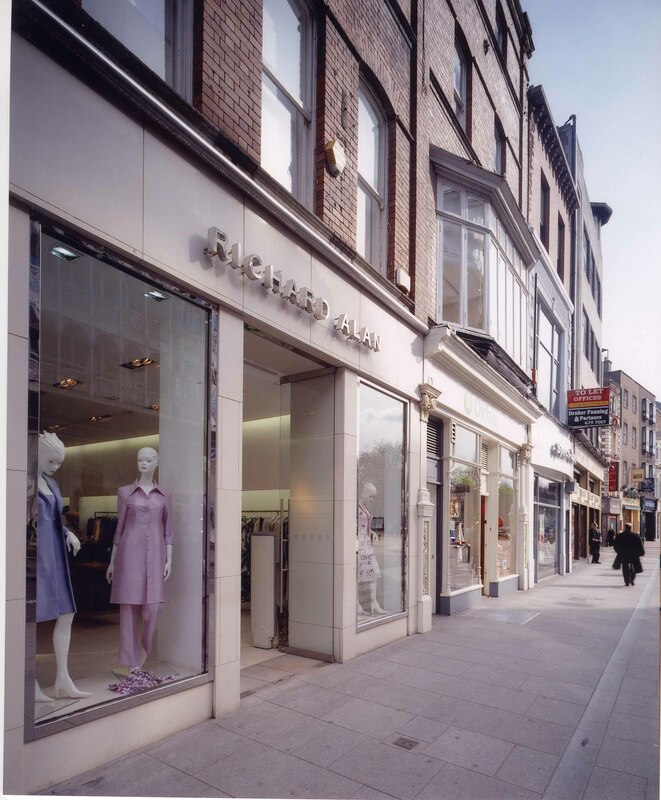 The shopfront attempted to ‘tidy up’ the original façade which was strewn with cables all of which were incorporated into a stainless steel half round tube which also formed the cornice to the French Limestone and polished stainless shopfront. The shop name and number were fabricated from polished stainless steel with each letter back illuminated in white light. The shop is a ladies fashion boutique. The palette of materials for the shop was restrained: French limestone, glass –clear and opaque, stainless steel, American black walnut and red valour. The scheme is arranged around a 7 meter long walnut table indented to provide a seat for two. This element draws customers deep into the shop allowing all the merchandise to be viewed. 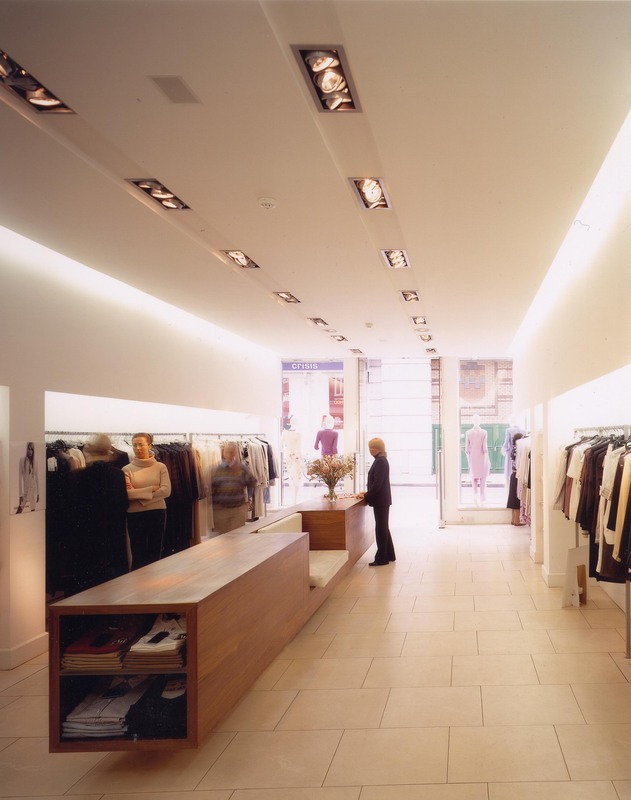 Direct artificial light arranged in two parallel rows and indirect lighting at the ceiling edge and behind the clothing reinforce the symmetry. 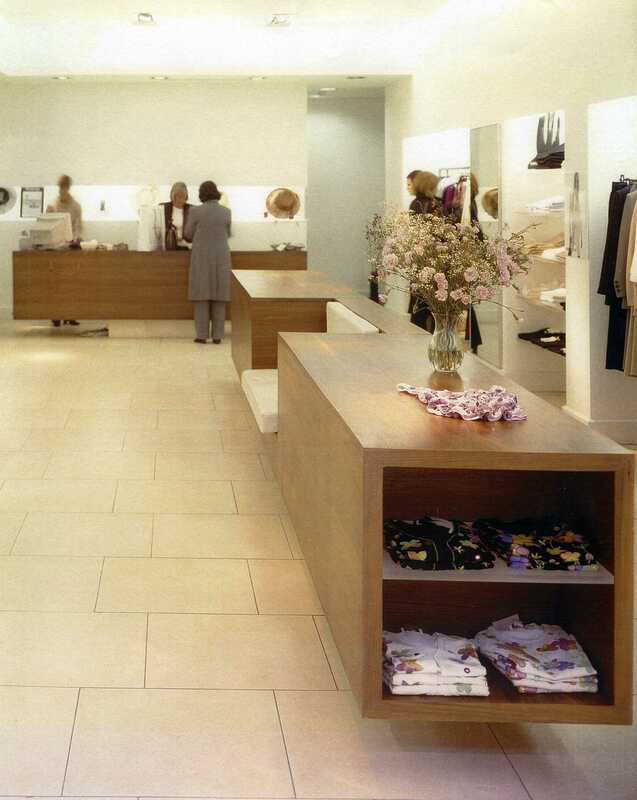 Removing all clutter from the floor of the shop allows the central table play its primary role for the laying out of clothing for prospective customers. Changing rooms have opal glass dividing screens and red valour carpets. Careful attention was paid to the lighting strategy. The perimeter ceiling included recessed high frequency fluorescent strip giving a separation between ceiling and walls. Clothing is arranged in blocks of colour, hung on simple stainless steel rails, recessed and illuminated from above with double rows of twin high frequency fluorescent lighting. The performance table and the front face of the clothing was highlighted and washed by low voltage Gimble fittings with different intensity and reflector angles. The seat was intended to place the gentleman in the lives of the female customers thronelike at the centre of the space!